I bought 3 modems! Do I get a deal? I bought my 1st modem a month ago and registered with the medium data plan. I'm happy with the product! I now have 2 more modems on the way. Do I have to have separate data plans under my name or how does this work? Is there some kind of plan for this? Yep you get the deal of your credit card getting billed 3 times a month lol. But, the good deal is you get to enjoy lots of pics. @johnsonjosh3 Unfortunately right now we don't have the ability to 'pool' data plans between modems, so each modem will have to have it's own data plan. However you can definitely put all 3 modems on the same account! Does data roll over to the next month? @johnsonjosh3 Data doesn't roll-over, but resets on the 29th of each month. @Moultrie_Ninjaneer You guys really need to pool data plans because that will set you guys apart from other guys that are coming after you! Basically, some of us may never use 38 MB of data even if we have like 4 or 5 cameras because some of us can't use bait to get lots of pics. I only getting about 50-100 pic per month on my most active camera. Anyone else agree? Please "like" this post if so!! I like my few pictures a week. No alerts. Open the app when I want. 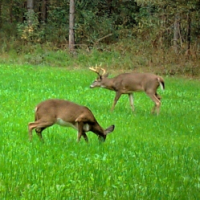 600 pics a week of does and fawns eating corn with the turkeys gets old. I'd start counting spots on the fawns. I would buy more modems and cams if the service rolled over.